Cakes are synonymous with celebrations. If you're hosting a holiday party, it will only be a special occasion if you have a pretty cake... especially for the holidays! As Julia Child once said, "A party without cake is just a meeting." Traditional French yule log of chocolate sponge cake with milk chocolate mousse. Decor: dark chocolate ganache, meringue "mushrooms" and chocolate "pine cone". It's so charming as well as surprisingly light and fluffy! Gingersnap quince cake & brown butter frosting. Loved this cake! Subtly spicy flavor with a creamy frosting! Chocolate biscuit, Valrhona chocolate mousse, hazelnut feuilletine. Sophisticated presentation and refined flavors! 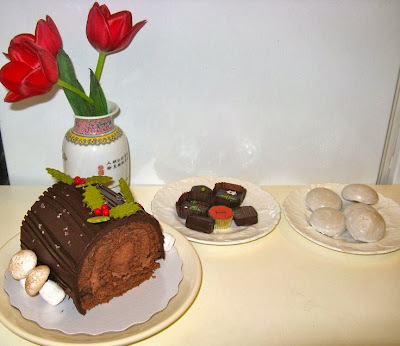 I shared the small Bûche de Nöel from Miette Bakery with several friends, accompanied by chocolates, gingerbread cookies and hot spiced apple cider. It was a cozy and fun get-together! Everyone loved the charming yule log with its adorable holly leaves and handmade woodland-theme decorations. The cake is delicious and quite light, so it will make a welcome addition to your holiday dinner table or buffet. Holiday buffet table featuring Miette Bakery's Bûche de Nöel! I would like to eat a bit from each of these right now please! 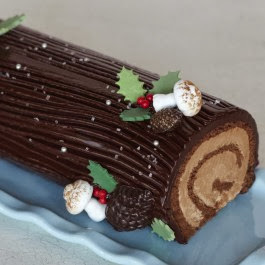 The log cake looks delicious! I wish I could find a recipe and replicate it. This cake is actually quite simple to make. 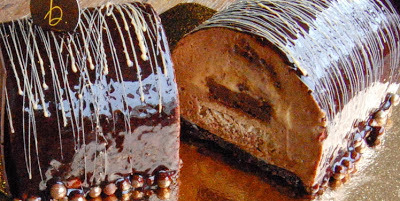 It has a chocolate-whipped cream filling rather than the typical buttercream (which is much more complicated).